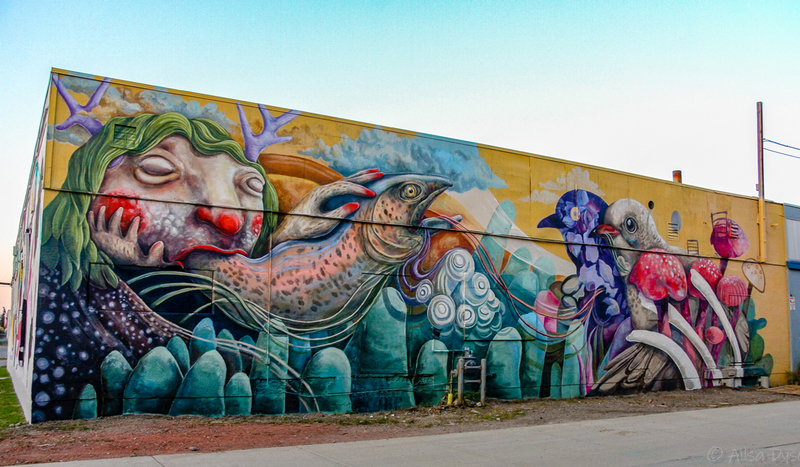 Eleven colourful murals are now scattered throughout Calgary’s Beltline neighbourhood. Here’s where you can find them, how to take the perfect Instagram photo and what to check out nearby. 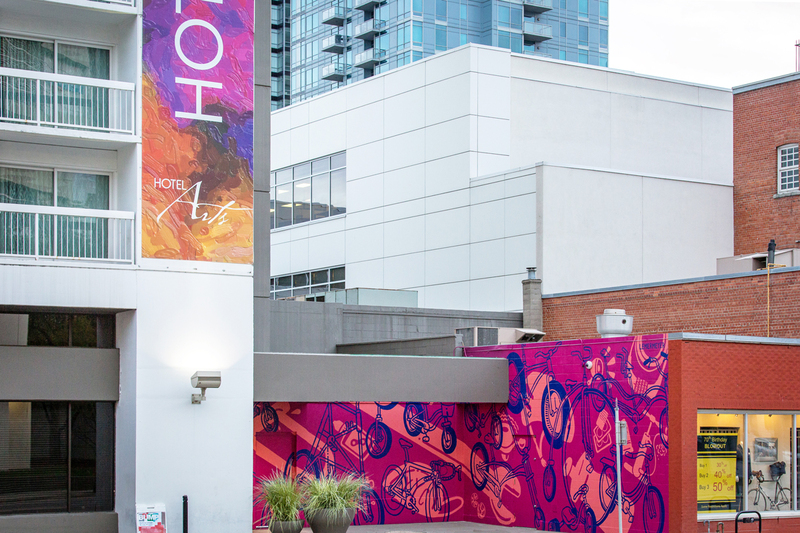 By now, you’ve probably heard of, or at least have seen, the colourful murals covering buildings throughout the Beltline. 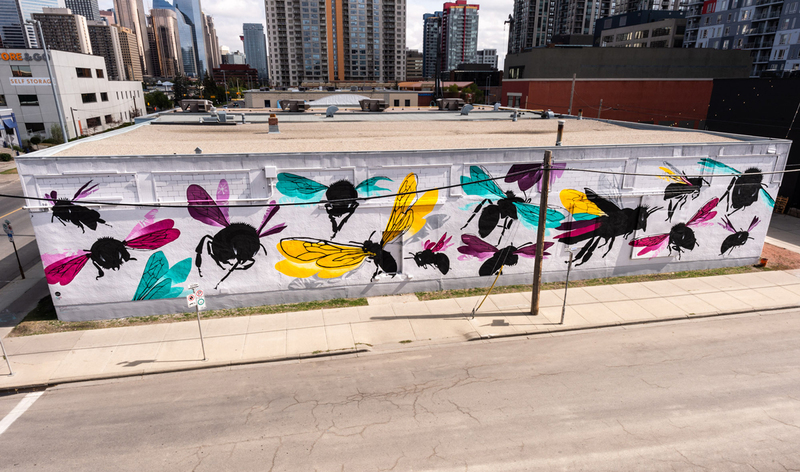 BUMP (Beltline Urban Mural Project) is an initiative by the Beltline Neighbourhoods Association to brighten up the community and showcase art. The murals are permanent and started going up in 2017. There are currently 11 fully completed murals decorating the sides of commercial buildings that house stores, restaurants and apartments. 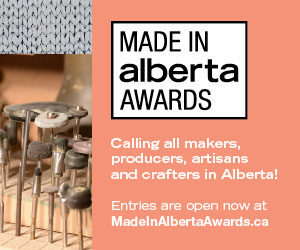 The artists come from Calgary, across Canada and one lives in Los Angeles. The artists are not only muralists, but they are also illustrators, graphic designers, painters and even architects. Here’s where you can find the 11 BUMP murals, plus information on the artists, how to take a great photo for Instagram and places to check out nearby. Use the map below to do a walking tour of all the murals in one day or go section by section. Nearby: Browse the curated racks of consigned vintage clothing at Velour Clothing Exchange. Pick up some crystals and incense at Earth Gems then stop for a Slaw Dog with coleslaw, chili, mustard, cheese and pickles at Tubby Dog. Nearby: Pick up a new pair of Blundstone boots inside at Gravitypope then go to Home & Away to eat fried chicken and play giant Connect Four. 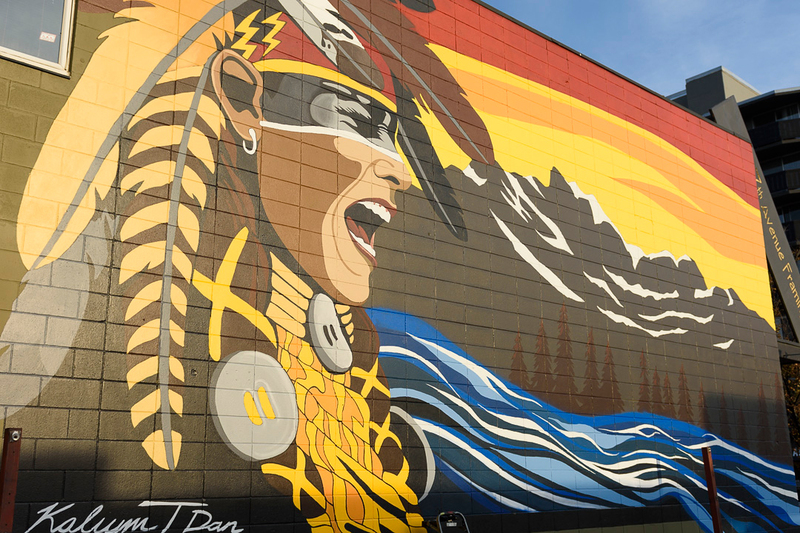 The mural: This mural of a singing Blackfoot man located outside 17th Avenue Framing was the first BUMP mural created by an Indigenous artist. Calgary’s Kalum Teke Dan is best known for his portraiture that reflects his Southern Albertan heritage and the spirit of his people. The piece was created in collaboration with Colouring It Forward, a local organization that promotes healing and reconciliation through art. Nearby: Go to Made By Marcus across the street for a scoop of chocolate fudge brownie ice cream. If tacos are what you’re craving, Los Chilitos has 10 different kinds on the menu. 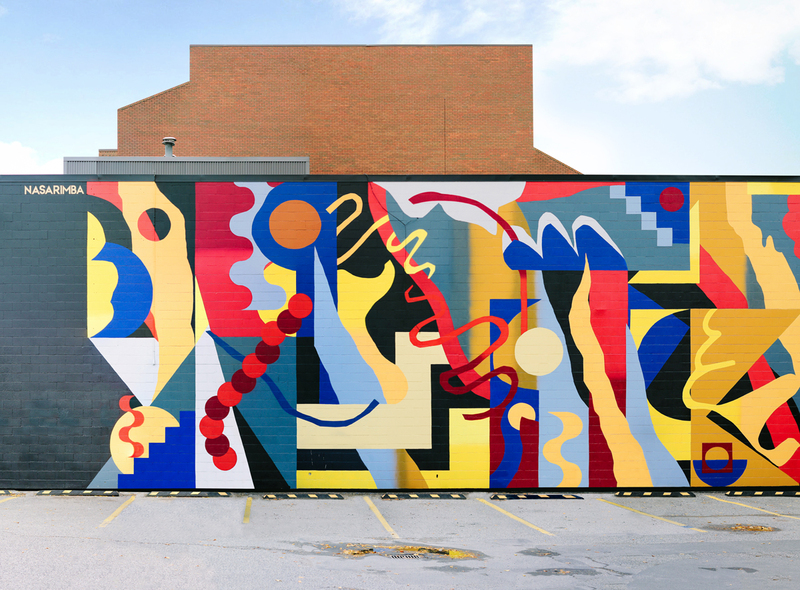 The mural: The inspiration for this abstract pattern painting came from many things, including color theory, geometric designs and quilt-making. 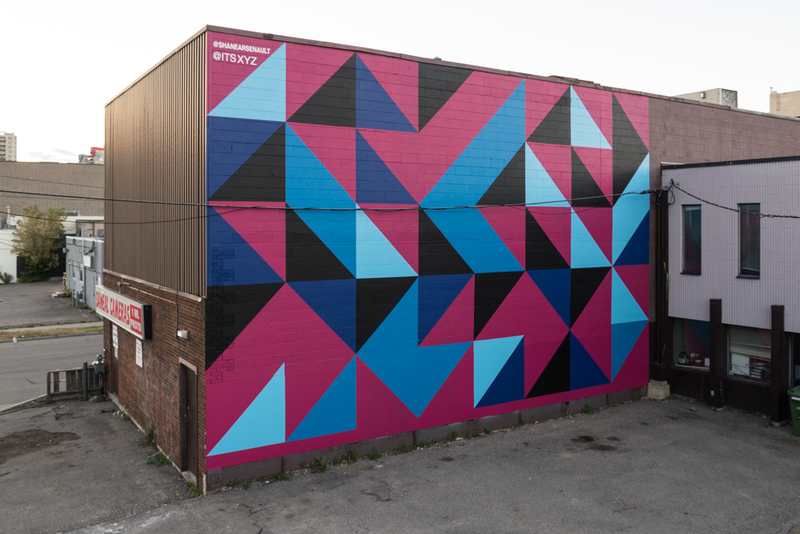 Calgary artists Shane Arsenault and Rhys Farrell, who met at ACAD, say their goal with this mural was to brighten up the neighbourhood and bring positivity to the community. They recommend going on a Sunday when the camera store is closed so that the parking lot is clear. They recommend standing in the middle for the photo so that you are completely surrounded by the shapes. Wearing matching or contrasting colours will make you stand out against the bright wall. Nearby: Walk across the street to Tandoori Grill for some authentic chicken vindaloo and samosas. This spot does dine-in or take-out. Where: 10 Ave. & 12 St. S.W. 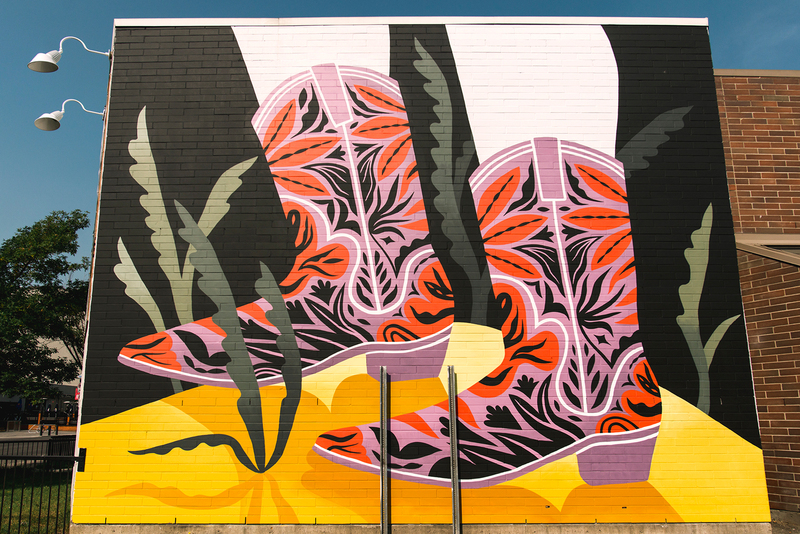 The mural: Calgary artist Katie Green says her intention for her work is to leave a sense of playfulness, magic and mystery. The inspiration for the mural came from the wall itself. She explains that when she went to take a look at the site, she noticed a pigeon nesting in a large hole where a vent used to be. The creature with the fish coming out of its mouth (which Green says is her favourite part) is a depiction of a small ceramic piece she once made and she was curious what it would be like in 2-D. Nearby: Spend some time at Heritage Posters and Music to browse through new and used vinyl and concert posters. The mural: The title of this mural is “Bee Together”. Artist Natalie Nehlawi— who is from Kanata, Ont., and is a first-generation Canadian from Syrian parents — says she painted a swarm of bees in flight to symbolize their strength and fight for survival. She intentionally uses unnatural colours to add to the beauty of the bees. Since it is a long mural, the artist suggests taking a photo from an angle so that you can capture the wings. Nearby: Go have brunch at Monki Bistro. There’s almost always a wait, no matter the day, so get in line by using the NoWait app while you’re at the mural then walk over when your table is ready. 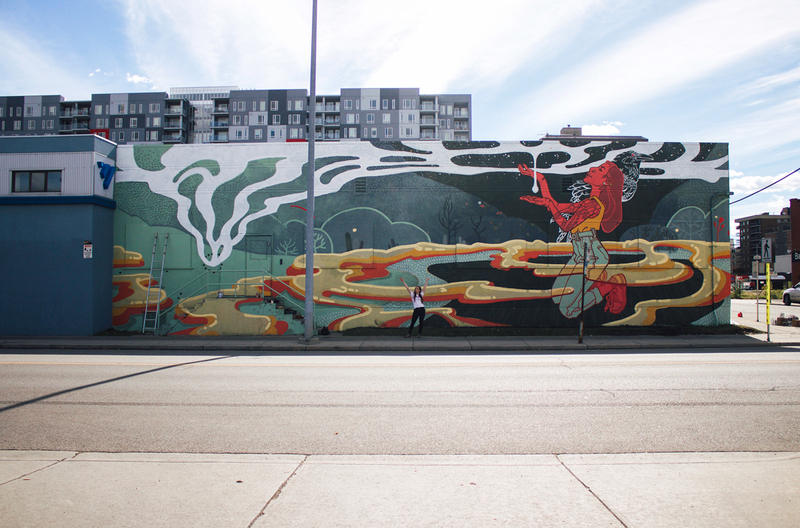 The mural: This mural entitled “Milk” by Calgary-based muralist and illustrator Nicole Wolf was inspired by a spiritual experience she had where she saw a large raven on her shoulder. In the Metis tradition, the presence of a raven symbolizes being able to hear from the Creator. Wolf says she chose colours and shapes that she hopes emit feelings of peace and comfort. To get a great photo, she suggests sitting on the stairs on the left to wrap yourself into the mural or taking the photo from across the street to capture the entire piece. Nearby: Pop into Community Natural Foods to do some healthy grocery shopping and grab a bite to eat or a coffee at the in-store cafe. The mural: You can find this mural entitled “Beyond Your Limits” on the outside of The Bike Shop. Artist Ilana Pichon is based in Quebec City and has a master’s degree in architecture. When painting this piece, she chose shapes, patterns and colours that integrated well with the wall’s architecture. 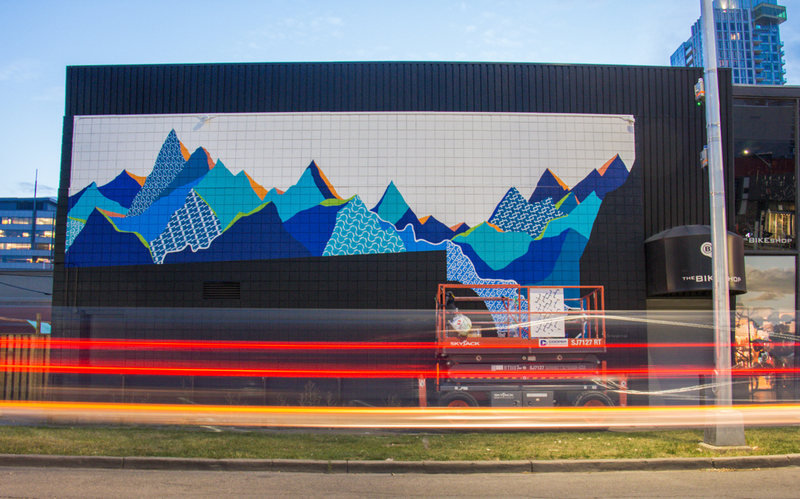 The mural represents going outside your boundaries, which is why she painted literal boundaries here with the map of the Beltline, mountains and rivers. There are also five bike patterns painted into the mountains — the bike, handle bars, the seat, chain wheel and pedals. She recommends taking a photo from across the street to capture the entire mural, but then getting up close to look at the graphic patterns. Nearby: Go inside The Bike Shop to look for a new helmet or cycling shoes. The store also sells running gear, casual shoes and athletic apparel. Where: 735 12 Ave. S.W. The mural: This is by far the tallest of the BUMP murals. It’s painted on the outside of a condo building. The artist, Faith47, is from Cape Town, South Africa, and she currently lives in Los Angeles. She is an internationally acclaimed muralist who began as a graphic designer when she was just 19 years old. She’s painted murals across the world in Canada, Europe, Africa, Australia, China, the United States and more. It’s best to take a photo of this mural from an angle to capture its entire length. Nearby: If you happen to be in the market for bridal, check out Evalina Couture. Or, grab dinner at Mirchi for chicken biryani or tandoori barbecue. It made our list of the Best Indian Restaurants in 2017. 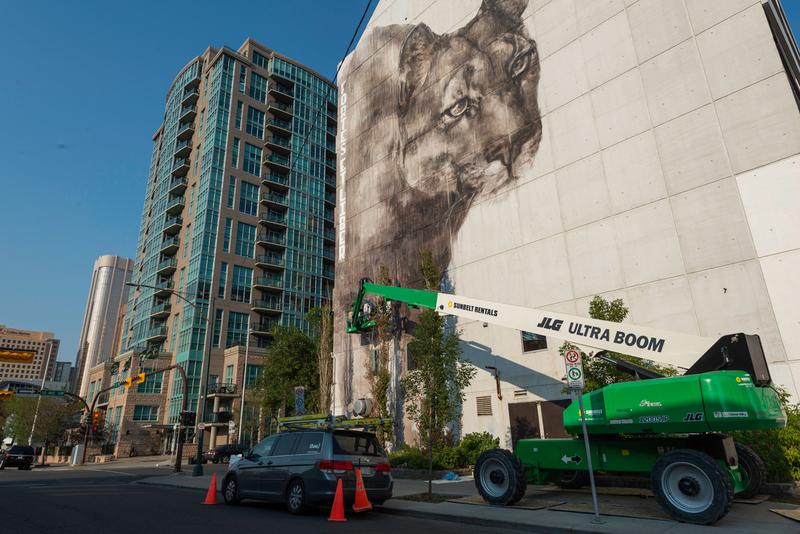 The mural: Calgary illustrator Tyler Lemermeyer was a bike messenger for eight years early on in his career and is still a passionate cyclist. The mural is entitled “No More Despair” and was borrowed from a quote by British writer H.G. Wells: “Every time I see an adult on a bicycle, I no longer despair for the human race.” He says he hopes the piece shows people that public art and bikes are becoming a part of Calgary’s culture. For a great photo, he suggests standing in the corner a few steps away from the wall. Nearby: Walk to 11th Avenue S.W. and stop into Gibson Fine Art to see contemporary works by Canadian artists then have a pint of Show Pony Pale Ale at Last Best Brewing Company. The mural: This mural by Montreal artist Kevin Ledo is located on the outside of the City of Calgary City Centre Parkade. It’s entitled “sôhkâtisiwin”, which is the Cree word for strength and power. 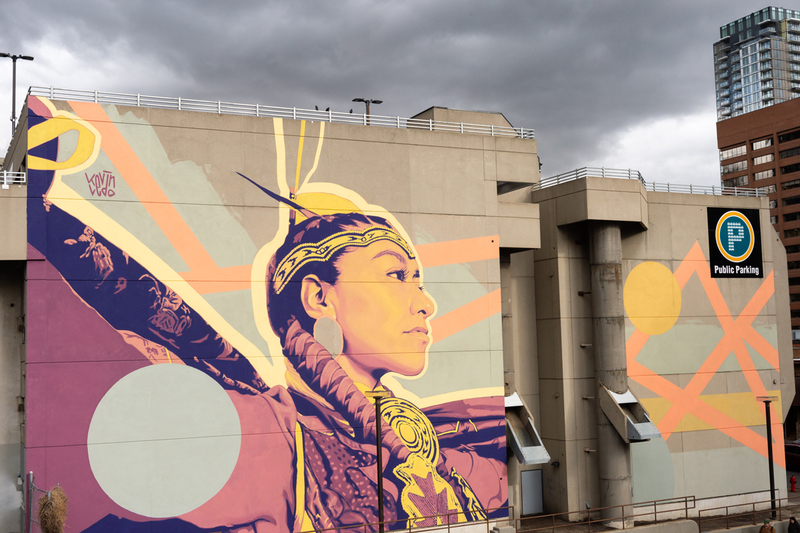 The woman in this mural is traditional fancy and hoop dancer Angela Gladue, who is from Alberta and lived in Calgary for many years. Ledo’s work often celebrates people and diversity and is sometimes inspired by photography. 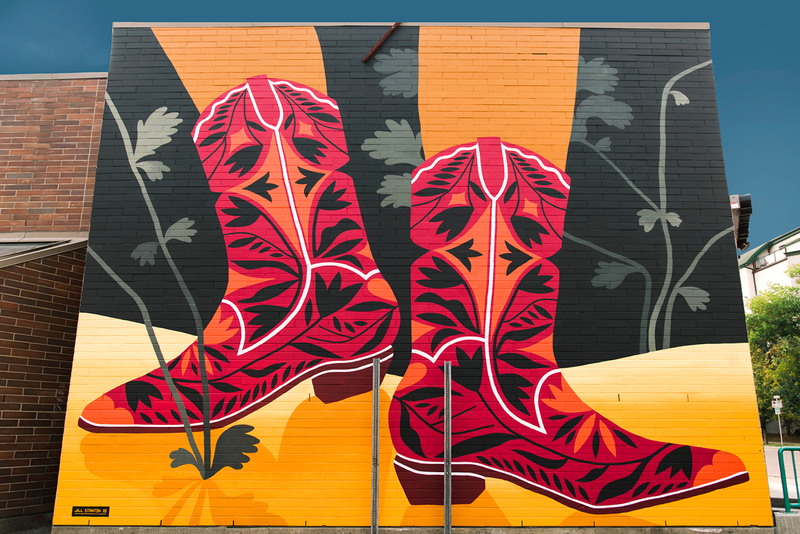 This mural was based on a photograph taken by Calgary photographer Candice Ward. He uses graphic orbs and vector lines to depict wonderment, joy and contemplation. The artists suggests walking across the street to get the best photo. Nearby: Cross the street to go to National Bowl. On Saturdays and Sundays, you can take advantage of “Brunch and Bowl” with an hour of free bowling if you have brunch upstairs at National on 10th. You can redeem your free lane from 11 a.m. to 3 p.m. and 4 p.m. until close.